NOTE: This review was originally written for the theatrical release of the film. In just about all of Wes Anderson's films, childhood has somehow chafed against the harsh disappointments of the adult world. Even when only dealing with youngsters in flashback or even memory, the bruised grown-ups are haunted by the failures of their elders to live up to their expectations. There is always a yearning to return to a simpler time, no matter how ill-fated the journey. One can't help but remember the sadness of Margot Tenenbaum going to the ice cream parlor with her neglectful father. It's too late to make up for missed opportunities. It's fitting, then, that with Moonrise Kingdom, Anderson would embrace a childhood fantasy for real, creating two characters who try to live the lives they imagine their parents, teachers, and other elders are squandering. It's a magical endeavor, one that is full of both the wonder of youth and its inherent heartbreak. Moonrise Kingdom is a movie packed with impossibilities, but also riddled with the pragmatism that only comes from an artist whose innocence has been dashed on the rocks of adulthood. Newcomers Kara Hayward and Jared Gilman star as Suzy and Sam, two tweens living in a remote seaside town in New England in 1965. Suzy is the daughter of married lawyers (Billy Murray and Frances McDormand), and she's cursed with three younger brothers and emotional outbursts that sometimes turn to violence. Sam is a newly orphaned Khaki Scout who never seems to fit in with the other kids. He and Suzy met due to happenstance and immediately struck up a correspondence. In their letters, they planned to run away together and live by the ocean. This is, ostensibly, where Moonrise Kingdom's story begins. The front portion of the film involves this escape and the efforts to find them. 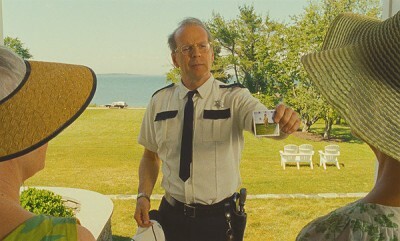 Scout Master Ward (Edward Norton) enlists local lawman Captain Sharp (Bruce Willis) to try to find the boy. Sharp also has a connection with Suzy's mother, adding an urgency, as well as a palpable tension, to the hunt. While life in civilization falls apart, Suzy and Sam set up an idealized existence far away from it. She has come armed with a portable record player and her favorite books; he has finally found a use for his knowledge of camping and nature. They trade secrets, frolic in the sand, and even share a first kiss. It's like The Blue Lagoon, but without all the skeevy leering. The perfection ends when the kids are found. The lovebirds and those in charge of looking after them have to face the reality of the situation. 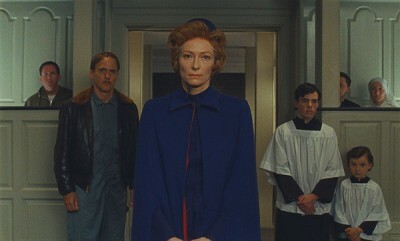 Social Services (represented by Tilda Swinton) is coming for Sam, and both children's exposed unhappiness really exposes the unhappiness of everyone around them. Yet, this being a Wes Anderson movie, Sam and Suzy and the other kids caught up in this aren't so quick to give up. More daring adventures are to be had! There is a delicacy to Wes Anderson's films that causes detractors to dismiss him as a one-note phenomenon and misguided supporters to insist he slavishly maintain whatever ideals and aesthetics they are convinced define him. 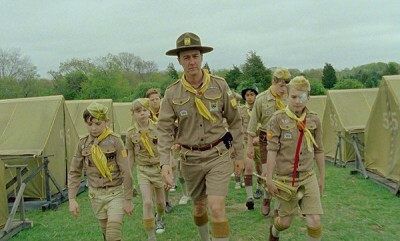 The former may see Moonrise Kingdom as a creative retreat put into motion by the drubbing members of the latter gave the auteur following 2007's The Darjeeling Limited [review 1, 2]. Neither side is right, nor are they wrong, but they both fail to see that the true beauty of Wes Anderson's films is that they are all of one piece. Unlike probably any other filmmaker working today, Anderson labors in an extremely personal space, and he is incapable of expressing himself outside of it. He has the things he likes, and he has a way he likes to show them. This is why the director can do a stop-motion animated film like The Fantastic Mr. Fox [review] and have it still look like he created it. This is not a bad thing. We could use more artists like him who stand steadfast and don't let their vision get ground up by the great machine. If this means more movies about little girls in cute dresses carrying suitcases, the boys who obsess over them, and the parents that just don't understand, all set in some otherworldly zone where every prop is glued together by nostalgia and pretention, then so be it! I'm on board! 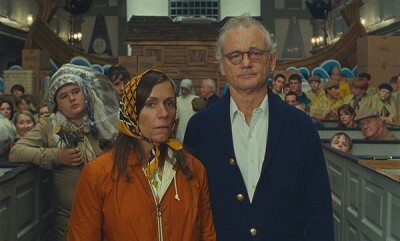 Every frame of Moonrise Kingdom is carefully planned. Robert D. Yeoman's camera is placed just so, and the actors--who are uniformly excellent--are positioned in front of it in an exact way. The things they carry with them and the clothes they wear are tailored to fit Anderson's storybook world, and logic and reality bend to conform to his boundless imagination. 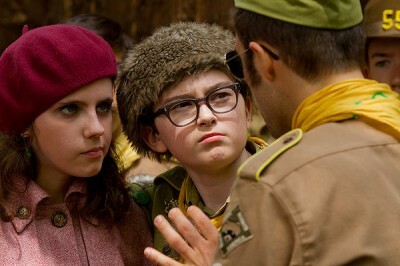 There is an almost Saturday morning cartoon conception of physics at work in Moonrise Kingdom. Whatever calamity little Sam has maybe seen Daffy Duck survive, he can survive, too. At the same time, Sam and Suzy are at an age where complicated things are being deconstructed. The movie opens and closes with a recording made to teach children the many facets of classical music. Likewise, Sam meets Suzy by peering backstage at a musical production of Noah's Ark, at once exposing the illusion of theater and the embellishment of myth. If Suzy can dress as a raven and sing as one on stage, then why not also put on a grown-up's uniform and pass beyond the veil of youth? Anderson's ensemble is wonderfully balanced between established professionals and unseasoned child actors. The big names--in addition to those already mentioned, we also get brief appearances from Harvey Keitel and Bob Balaban--adjust perfectly to Anderson's unique approach, dropping their usual technique for something far more simple. This choice fits the thematic thrust of Moonrise Kingdom, because for all the nuance the big folks lack, the little guys more than make up for it. Kara Hayward and Jared Gilman have an unaffected chemistry. There is a baldness to their performance that more polished actors would have to labor to unlearn. This dichotomy is like the two dominant, yet opposing, elements of the film's soundtrack: it's the flourish of classical music vs. the raw heartbreak of a Hank Williams ballad. It's not really either/or: it's about being able to cope with both. 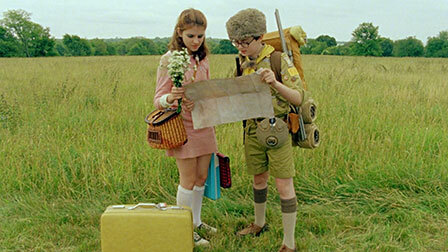 In all honesty, it's hard to exactly get at the magic of Moonrise Kingdom. You might as well try to grab the moon itself when it appears above the horizon. You know it's a real thing out there, you know it's a solid mass, but to reach for it is to emphasize just how far away it really is. You splash your hand in the water and destroy the image. 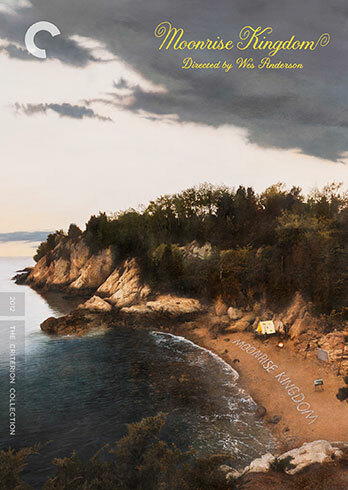 So it is with Moonrise Kingdom. You just kind of have to accept the indefinable and the irrational and let it be. The same way you did when you heard a fantastic story as a kid, holding your breath and trusting the storyteller to get you where he or she is going.